Over the last couple of nights I’ve been reading through the rules and boning up on Automobile. It’s a relatively heavy game (for me) that pits players in the early days of the automobile business in an endeavor to make the most money buy building the right number of factories in the right locations, hiring the right number of salesmen and allocating them to the right models, manufacturing the right type and right number of cars to meet demand, and knowing when to cut your losses and shut down older plants. The game is ruthless to risky players that end up outproducing demand or underproducing with too many salesmen as well as those that play overly cautious. The winner will be the player that plays just risky enough. It’s difficult to get a good feel of the game playing a few solo turns since some of the information is supposed to be hidden (i.e. total demand) but I can see that I’ll like the game once I get a chance to introduce it to my group. 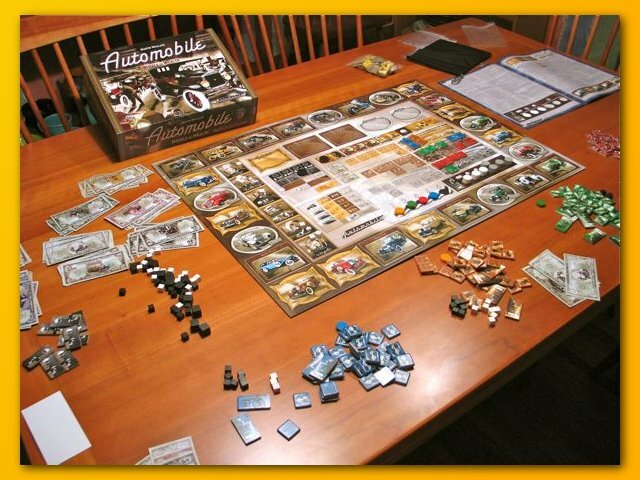 Automobile is designed by Martin Wallace and seats 3-5 players. The listed play time is 2 hours so I’m sure that in my group, that first game will drag out to about 3. I am however, looking forward to it. In a recent game order I received a copy of Glen More, Automobile, Qwirkle, and Fairy Tale (thanks Game Surplus!) and when I opened the shipping box, my daughter reached in and grabbed Qwirkle, turned it over in her hands, and asked if we could play it. My daughter used to be my gaming buddy, helping me go through the rules of a new game, organizing and bagging bits, playing a few sample rounds, etc. but as she’s gotten older, she’s focused more on iPod Touches, friends, driving, photography, Facebook, boyfriends, etc. I always feel a little pang of nostalgia when I see her go off and do something else when we try to organize a family game night so when she asked to play Qwirkle I immediately said yes and had her open the box and we started reading through the rules. 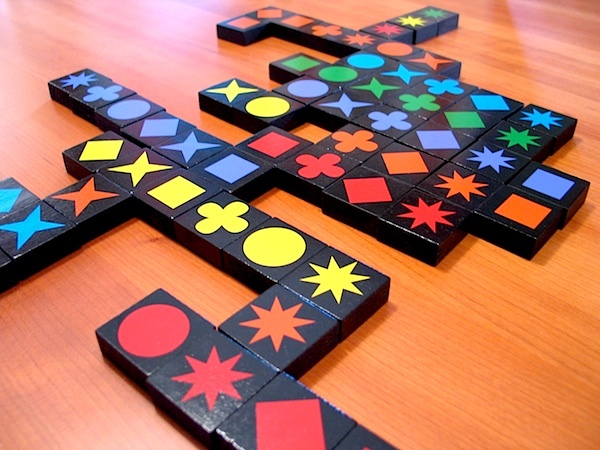 Qwirkle was a 2011 winner of the coveted Spiel des Jahres Game of the Year (albeit a controversial one) among other honors. It accommodates 2-4 players for about 45 minutes depending on how much time and effort you put into maximizing the points on your move. It firmly sits in the family, light gaming, arena but I must say it does heat up the brain a bit trying to figure out those great moves. It feels a bit like a lighter form of Ingenious with simplified scoring, no limited board size, but more restrictive tile placement rules. The game comes with a linen bag and 108 wooden tiles and a set of rules. There is no board. The tiles depict 6 different shapes (diamond, circle, square, star, starburst, & clover) in 6 different colors (blue, red, orange, purple, yellow, & green). There are three of every tile (e.g. three green squares, three yellow circles, etc.) Players draw 6 tiles and place them in front of themselves keeping them hidden much like a rack of scrabble tiles. A turn has two phases: 1) playing 1 or more tiles to the table or discarding 1 or more tiles and 2) refilling your hand back up to six tiles. If you are discarding tiles, as a last step you put your discarded tiles back in the bag. When playing tiles to the table, the tiles you place on your turn must share attribute (shape or color) and you must place them in the same row or column of the grid on the table in the same connected cluster and that cluster must also share the same attribute of the tiles your are laying. However, you are not required to have all of your tiles touch each other. In other words, you are allowed to split them as long they end up in the same row or column and they end up in the same connected cluster of tiles. A further restriction limits any clustered group from containing a duplicate. Restricting a cluster from containing a duplicate tile means that the maximum length of any cluster will be six. For example, if the shared attribute is color (blue), then the longest chain/cluster would contain blue tiles each with one of the six symbols. Any additional blue tiles would duplicate a symbol. If the shared attribute is the shape, then the maximum cluster could not contain more than the six different colors without having a duplicate. There are two ways to score points, after laying your tiles, you count in the four directions out from any new tiles you lay and simply count the length of any chains you’ve added to. If you make a row of three tiles extend to five tiles by laying two more tiles, you’d score five points. If on that same move one or both of your tiles makes a column longer you’ll also receive those points as well. If you manage to place a tile that includes the sixth tile in the group you earn a bonus of six points, a Qwirkle! I’ve played a few times now with different numbers and I think it plays best with two or three. With four, although still enjoyable, play seems a bit chaotic as a lot can change by the time you get to play again. I’ve also had luck introducing the game to a group of neighbors. It’s easy to teach given a few examples and it’s a bit deeper than you’d think at first blush. The neighbors exhibited a few groans when fellow players “took their move” so there is a bit of conflict. There are two ways of playing where you can play with the hope of lining up subsequent plays (by trying to align tiles in disconnected tiles in rows or columns so that subsequent tile play can join them with some common attribute), or defensively where you play to block Qwirkles by preventing a tile from being placed in a spot that would join clusters that don’t share a common attribute. 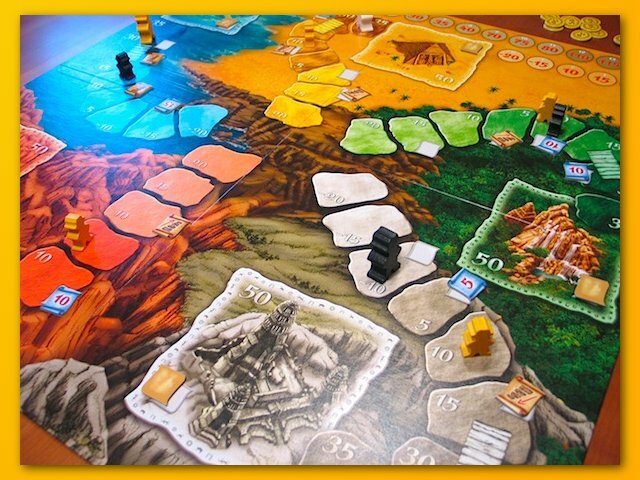 All in all, I like the game for what it is and think it’s a great game to have on the shelf for those light gaming situations where you might not want to pull out Ingenious or Carcassonne. A few months ago I had the opportunity to play Lost Cities: The Board Game. After a long wait on a 2nd print run, I received a copy as a gift and I’m glad to say I finally managed to play it again. 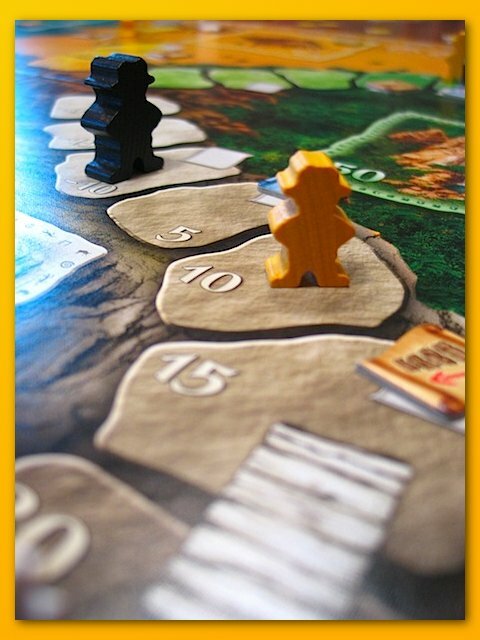 If you’re familiar with the two-player card game Lost Cities, you’ll be quickly up to speed on the board game version. But even if you’re new to both games, the mechanics are simple and you and your family will be enjoying it before you know it. The game retains the “exploration” theme by having each player represent researchers sent on treks along paths in search of victory points. The board features 5 spiraling paths in unique colors that match the 5 suits in a deck of 100 cards numbered 1-10 (2 copies of each card). As in the card game, players begin adventures by placing like colored cards in front of them. For each card placed, the player advances the appropriate researcher one step along the like-colored path. A player is restricted from placing more than one of their researchers on any single path but is free to start as many paths as desired (one for each suit of cards they have played). You’ll rarely be able to start all 5 researchers so you must decide which adventures to get involved in. Each placed card must be greater or equal to a previously placed card in that color so you’ll want to start with a low numbered card and grow as slowly as possible so that you can lay down as many cards as possible in that color during the round. As your researcher moves along the steps of the path, he ensures the number of victory points marked on the highest attained step (awarded at the end of the round). Each step on the path is worth points but they start out negative, decrease to zero, and then increasing to 50 points by the end of the path. Because of the inverted point system, you don’t want to start an adventure unless you’re sure you can move that researcher far enough along the path with subsequent card play to advance past the negative point values. There are five paths (5 suits) and you have 4 “regular” researchers and 1 “large” researcher who counts double when awarding points. If you cannot (or would rather not) play a card on one of your adventures and you don’t want to start a new adventure (lay down the first card of a suit you haven’t already started), you can discard a card to a suited discard pile. Like the card game, you play a card from your hand (or discard) and only then do you pick up a card from one of the suited discard piles (not your own card of course) or draw a card from the single draw deck. In addition to the point value marked on each step, each path houses several tokens scattered along its length. At the beginning of the round, these tokens (ladders, points, and artifacts) are randomized and scattered along the paths and when a researcher reaches a step containing a token the research can benefit from the type of token present. Ladder tokens allow the researcher to move this or any other already trekking researcher an additional step on their representative path. Point tokens immediately grant the player the number of points marked on the token. The ladder and point tokens remain on the path for subsequent players to also benefit from it they reach that level along the path. Artifact tokens, however, behave differently. The first researcher to reach the step containing the artifact grants the player possession of the artifact denying it from subsequent players. Artifacts are used for end game scoring. Near the end of of each path is a bridge and the round ends when any 5 researchers have crossed a bridge or the draw deck is exhausted. Players count their points and exchange their recovered artifacts for markers held until the end of the game. The tokens are shuffled and randomly placed on the steps of the paths, the cards are shuffled, and players score their points from the highest attained step plus any additional points awarded by reaching steps with point tokens. Researchers are placed back in the center of the board and another round begins. A game consists of 3 rounds (i.e. 3 mini-games). The artifact markers obtained throughout the game represent end-game scoring. Players use a scoring chart to find the number of victory points gained (or lost!) depending on how many markers you found during all three rounds. The awarded points drive players to try to find at least some artifacts during the three rounds so that they won’t lose points at game end. However, the more you find the more points you get for each individual artifact. More is better but artifacts are not a single path to victory. I like the game for what it is. It’s simple to teach and easy to grasp. It’s about the same weight as Ticket to Ride so it sits firmly in the family game genre and provides a nice way to pull in another 2 players into the mechanics presented in the 2-player card game. The ability to play cards equal to or greater than an existing adventure and the additional scoring opportunities provided by the tokens placed on the paths make the game more forgiving than the card game. We usually play with the tokens placed on the paths face-down. This provides a bit of a “what did you find? !” moment the first time somebody reaches the step. This is technically against the rules of placing them face-up. Having them face-down lightens the game even more taking away the knowledge of what paths are “worth going for” but we enjoy the a-ha! moment of finding things along the way more than the “fun” of the additional strategy.